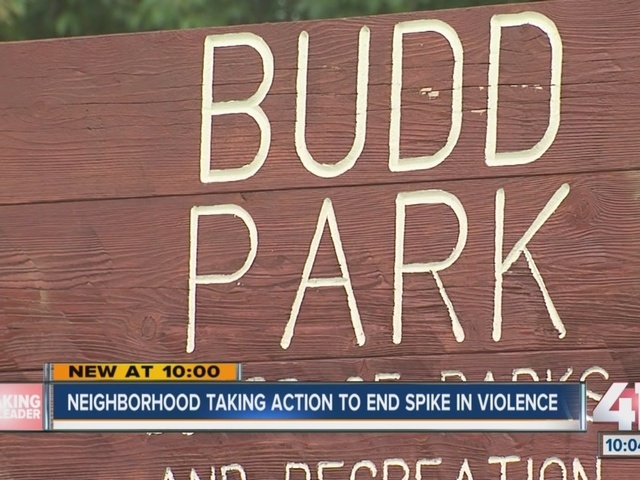 The Indian Mound Neighborhood Association met Monday night to discuss ways to stop the spike in violent crime. Budd Park is at the center of that crime. Many people enjoy the park during the day, but said they no longer stay after dark. "It's peaceful in the daytime,” said 14-year-old Frank Ruiz, who likes to hang out at the park with his friends after school. He always leaves when it gets dark. "Sometimes there can be bad people around here. And they do stuff they shouldn't be doing,” said Ruiz. Since July 26, seven people have died near Budd Park. Last week, less than a mile away at Ninth and Hardesty, a mother was killed after she got caught between two speeding drivers firing guns at each other. The rise in killings is why the neighborhood’s Monday night meeting was packed. It was the highest attended meeting all year. KCPD Community Interaction Officer Jason Cooley spoke at the meeting to talk to residents about the action police are taking and share crime statistics. "Every Monday we have a crime meeting to discuss the issues and look at the stats going back week by week and we target resources accordingly,” Cooley explained. "A lot of times by doing that, we try to get out in front of the issues as a pattern is developing, instead of it becoming a full-blown pattern instead of coming in on the back end and trying to address it." Though violent crime is up, the statistics show rapes, burglaries and assaults are down. The community is planning another meeting next month which will include KCPD Chief Darryl Forte.